I eat oatmeal almost every day. It's filling and a good for you food. I've tried many different types of instant oatmeal packets in the past few years and haven't found one that I really like. 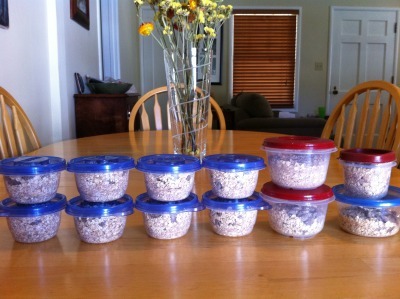 Last week, I read this post from Andrea who blogs at Simple Organized Living and decided to give it a try. This is the simplest way to make breakfast! Just dump everything in a big bowl and mix. The finished product 12-1/2 cup servings. Tomorrow, I'll try my first pack and I hope it turns out as tasty as I think it will. Stir all ingredients together and place in containers. When you're ready to eat, add water and microwave until desired consistency is reached.